What do you get when you add mathematics and chalkboards? 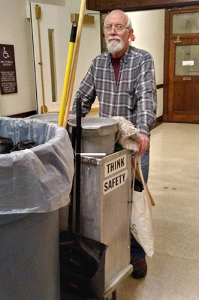 Grant Cole, a building service worker from Facilities & Services who worked in Altgeld Hall, can answer that question: Dust, and lots of it. As a cleaner in one of the busiest buildings on campus—a mathematics building to boot—Cole knew how the learning process could be accompanied by clouds of dust as dense as the morning fog. The question was, what to do about it? Anybody who knows math professors knows how they love their chalkboards. But nobody seemed to have a good solution for the gritty side effects. Toshua York, director of budget and resource planning in the Department of Mathematics, said the problem seemed hopeless. Cole did his best to combat the problem. At the request of faculty, he switched out erasers in the middle of the day and washed chalkboards between classes. But Cole was resourceful, and he brainstormed an easier solution. With some scrap metal, wood, and the help of his friend, Ralph Keil, Cole created a chalk vacuum at zero cost. It was a hit. 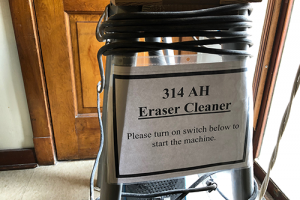 A year later, Cole’s popular chalk vacuum sits in Altgeld Hall, where students and professors alike slide the erasers over the device and condemn all those dust particles to a proper holding place. Rinat Kedem, professor of mathematics, would agree. Kedem actually has her very own chalk vacuum in her office. It was a gift from colleagues from Osaka, Japan, where she lived and taught for years. That’s where she developed a respect for chalkboards and chalk; every classroom in Japan has a chalk vacuum, she said. Kedem is enthusiastic about Cole’s solution to Altgeld’s dust problem. Cole’s supervisor, James Matthews, assistant superintendent of building services at Facilities & Services, is pleased with Cole’s initiative. Philippe Tondeur, professor emeritus of mathematics, has worked and studied at universities around the world, but the University of Illinois holds a special place in his heart and mind. 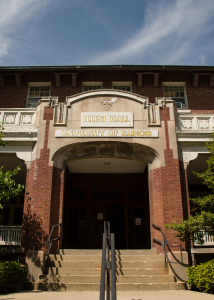 Tondeur has donated in support of the Campaign for Altgeld and Illini Halls, which includes a plan to renovate Altgeld Hall. The building—which serves as home to the Department of Mathematics where Tondeur once served as chair—was last significantly renovated in 1956. The university has announced that a major renovation of Altgeld is targeted for completion in 2024. Tondeur said he is proud to contribute to the project. “State of the art facilities will greatly enhance the student learning experiences,” he said. Tondeur attended college at the University of Zurich, where he earned a PhD in mathematics. He went on to serve as a research fellow and lecturer at the University of Paris, Harvard University, and the University of California at Berkeley before taking on the role of associate professor at Wesleyan University. 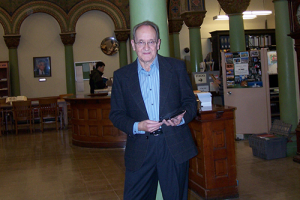 In 1968, Tondeur came to the University of Illinois and became a full professor in 1970. After serving as department chair, Tondeur served as the director for the Division of Mathematical Sciences at the National Science Foundation. Tondeur has given over 200 lectures at institutions all over the globe. He has also served as a visiting professor at about a dozen universities including the University of Buenos Aires, the University of Rome and Keio University in Tokyo. Even after spending so much time at other universities, however, Tondeur feels a strong bond with the University of Illinois. He noted that the “fantastic Department of Mathematics” is what originally drew him to working full-time at Illinois. “The attraction of the university was a position in a world-class institution, with a faculty wholeheartedly devoted to mathematics research and teaching,” he said. The renovation of both Altgeld and Illini Halls is projected to cost about $100 million, which will be funded by the state, campus and generous donations, including one from Tondeur. The renovation is coming at an important time. In the past 10 years, enrollment in the mathematics department has increased about 40 percent, which means updates to the facilities are needed to help accommodate a larger influx of students. Tondeur said he’s thrilled to be a part of much-needed renovations that will convert the building into a modern and enduring learning environment. Tondeur said he loved teaching at the University of Illinois and wants to ensure that students here receive the best possible education for years to come. The clock struck 12:50 p.m. and the Quad teemed with students during passing period. High above them, in Altgeld Hall, Jonathon Smith moved quickly, organizing his sheet music. He knew what many of them would think—that a machine was playing the chimes in the tower. They couldn’t be more wrong. Purposefully, with passion, Smith began to “play the tower,” so to speak. Playing the chimes is different than virtually any other instrument. It requires footwork. Smith glided from one end of the bell levers to the other, pressing them downward to adjust tension on the long lines that activated the clappers—metal balls within the bells. As the clappers swung and struck the chimes, the notes of “Hail to the Orange” pealed across campus. This isn’t the first time the Altgeld chimes have been played, not even close. They’re almost 100 years old. But after a recent renovation took them offline, their comeback has been relatively quiet compared to the rather downbeat publicity that occurred when they went silent. Now, the future of the Altgeld chimes appears stronger than ever. School of Music who have been actively playing the bells. Smith oversees a registered student organization, Altgeld Ringers, which is dedicated to making the playing more organized. Meanwhile, the renovation that silenced the chimes in the first place has improved the environment greatly. It was the first renovation in 60 years and the chimes needed it badly. 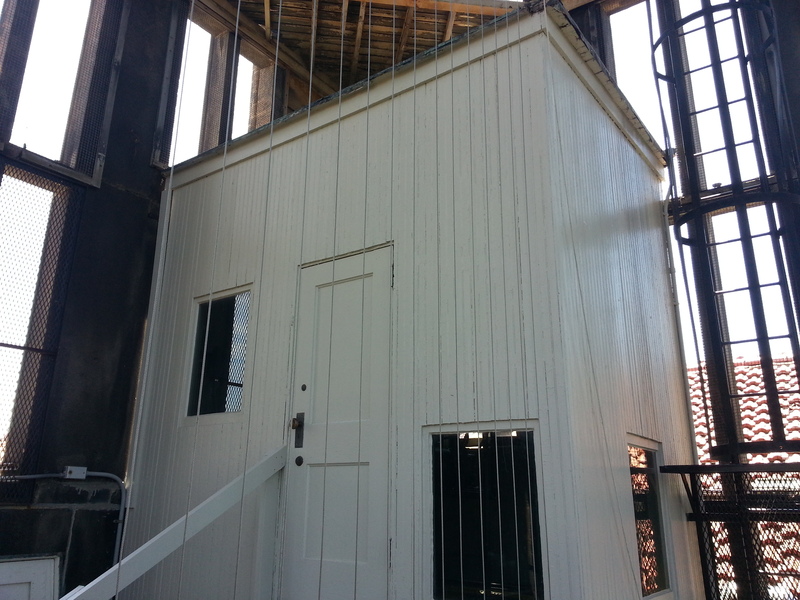 The room housing the instrument has new walls and has been repainted. New emergency and safety systems have been installed, new flooring has been put in place to make the floor level, railings were installed and gates put in place along the steep sets of staircases. The Department of Mathematics also supplied the room with new furniture, a computer, printer and a scanner for music arrangements and other administrative needs. 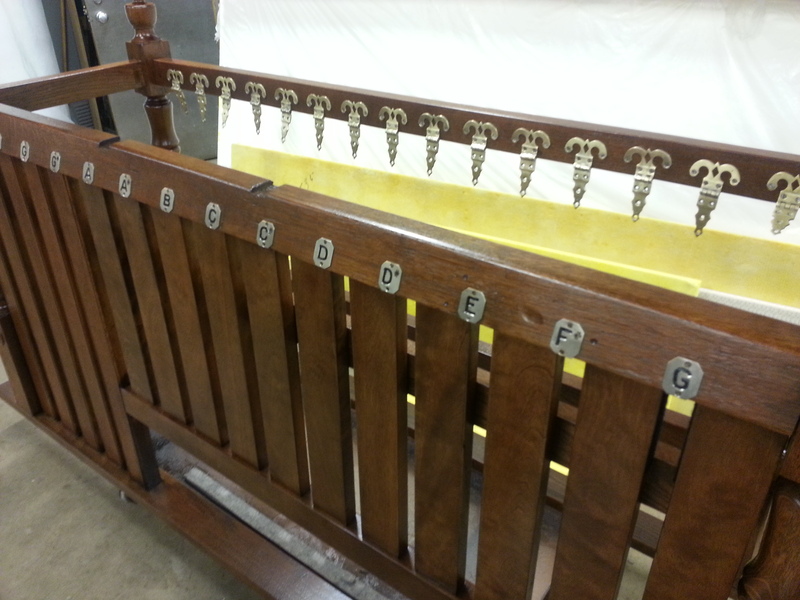 The chimes instrument, as well as the practice playing console, were completely refurbished. 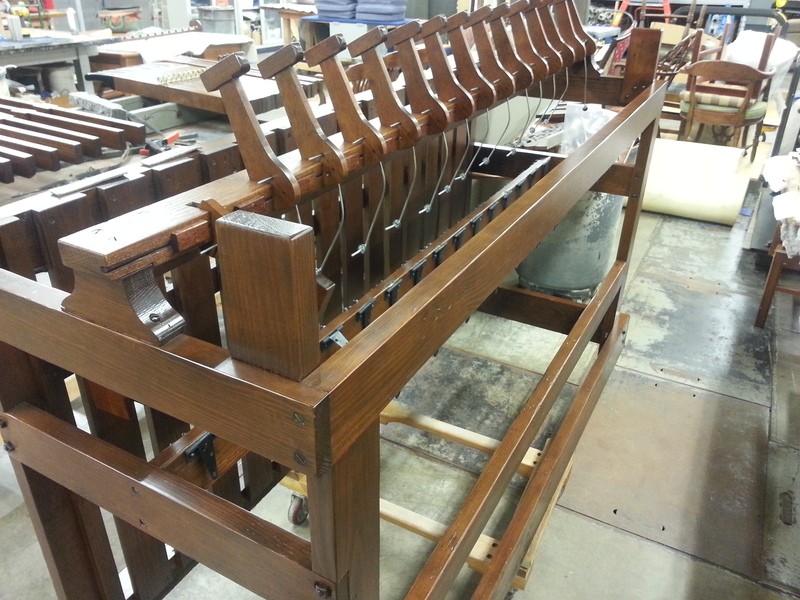 “It used to wobble, but it doesn’t anymore,” Smith said, of the chimes console. He’s been playing the chimes since 2011. 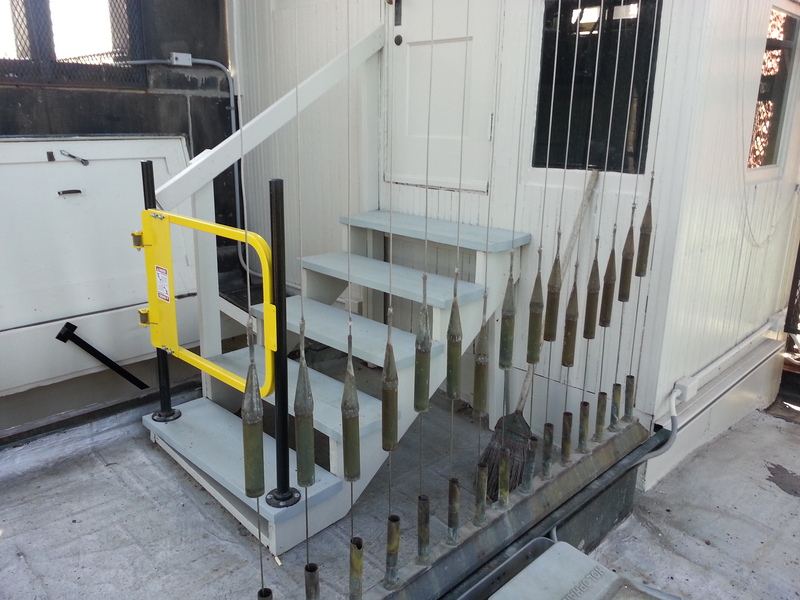 A new automatic system was also installed to keep the time, and changes were made to the chimes to ensure easier playing. While Smith and the rest of the chimes players have been grateful for the updates, Smith is committed to letting the history of the iconic place echo, too. Reminders of Sue Wood, who started playing the chimes in 1971 and served as chimesmaster from 1995 until the recent renovation, are all around. Illinois is one of the last schools to continue their chimes program, according to Smith. Many universities have implemented automatic systems or have failed to maintain their bells due to finances. But the chimes in Altgeld Hall have remained a unique fixture at Illinois. Players teach each other how to play the instrument. The chimes themselves were created with the specific intent of playing Illinois Loyalty. But today, students can hear everything from the theme song of popular cartoon Futurama to classical harp tunes from the 1600s, a testament to how the chimes continue to adapt to modern times. Since the initial renovations, public tours are no longer available. However, Smith is determined to share the charm of the chimes with the community and students, many of whom, like he himself once mistakenly believed, think the chimes are just some pre-recorded speaker. In fact, playing the chimes is a one-of-a-kind musical feat. A new data science center will be funded in part with a portion of the $500 million in state capital funding that was approved last spring to launch the Discovery Partners Institute and Illinois Innovation Network. Plans for a new statewide innovation network to accelerate job creation and economic growth include building a world-class center devoted to the fast-growing field of data science, U of I System officials have announced. The data science center will be created by replacing the university’s Illini Hall, which currently consists of primarily classrooms, computer labs, and faculty offices, with a state-of-the-art classroom and research facility focused on creating knowledge through statistics, data analysis, and machine learning. Additionally, the university plans to renovate Altgeld Hall. Built in 1897, Altgeld is the second-oldest building on campus, and is listed on the National Register of Historic Places. It hasn’t been renovated since 1956, when it became home to the Department of Mathematics. 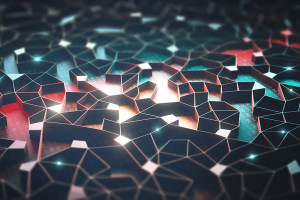 The data science center will be funded in part with a portion of the $500 million in state capital funding that was approved last spring to launch the Discovery Partners Institute (DPI) and Illinois Innovation Network (IIN). The university will contribute to the project. The Altgeld Hall renovation will receive funding from campus in addition to funding from donations and other sources, some of which has already been secured. Feng Sheng Hu, the Harry E. Preble Dean of the College of Liberal Arts & Sciences, said the building and renovation projects will link the data science initiative through DPI to the departments of Mathematics and Statistics while providing the departments with long-needed infrastructure improvements. The two departments currently share the bulk of the space in Illini Hall. The data science center project will create a new, 60,000- to 80,000-square-foot classroom and research facility on the current site of Illini Hall, which sits roughly a block west of the Main Quad on Wright Street. The new facility will be an incubator for collaborative research and education in data science, which is rapidly growing to include faculty and students from all over campus. Undergraduate enrollment in the departments of Statistics, Mathematics, and Computer Science have doubled in the last decade. The units also have deep connections with businesses that would serve IIN’s mission through internship agreements and alumni who work at Fortune 500 firms across the state and beyond. Faculty from the units are involved in interdisciplinary research that touches all fields at the core of IIN’s mission. Plans for DPI and IIN were announced in October. Work is currently underway on an implementation plan that will establish a timetable for opening and other details of the enterprise, where world-class researchers will work side-by-side with students and businesses to foster next-generation innovation and workforce development and address societal grand challenges of great importance to the state of Illinois and beyond. The DPI will be developed on a donated site along the Chicago River. The state is currently working on a bond sale that will provide capital funding to help develop the DPI, an innovation center that will be home to leading-edge research, and the IIN, a virtually connected network of regional hubs that bridge the distance between communities and foster collaborative discovery, education, and entrepreneurship, bringing energy and economic development to the entire state. The DPI will bring together top faculty in agriculture, health care, computing, environment, and other critical fields from the U of I System and partner universities that already include the University of Chicago, Northwestern University, and Tel Aviv University. Nearly 100 new researchers also will be added and together they will connect with hundreds of businesses and thousands of students over time, as well as with entrepreneurs and venture capital firms. 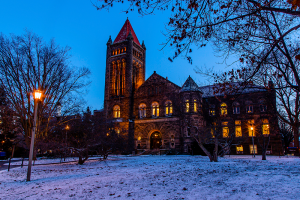 Altgeld Hall on a snowy evening. The renovation of Altgeld Hall is coming closer to reality after a campus committee conditionally approved allocating $27 million in student funding to modernize and upgrade the iconic building. The Academic Facilities Maintenance Fund Assessment (AFMFA) Oversight Committee approved the amounts for fiscal years 2020 to 2021 contingent upon the university securing the remainder of funds from campus, the state, donor gifts, and other sources. The renovation of Altgeld could be part of a larger project for both Altgeld and Illini Hall, immediately to the west. Modernizing both buildings will cost an estimated $90-$100 million. The AFMFA Oversight Committee includes student representatives who play a role in deciding how the deferred maintenance funds will be spent. Students at Illinois currently pay $334 per semester into the fund. Altgeld will be equipped with contemporary learning spaces, while also maintaining a focus on the roughly 121-year-old building’s historic significance. Mosaics, murals, and woodwork in Altgeld Hall’s library will be restored. “The committee comprised of student and administration representatives did an outstanding job supporting transformative projects that will contribute to the university’s excellence by upgrading building systems, enhancing energy conservation initiatives, and aiding in accessibility and life safety improvements. These selections will positively impact student experience for generations to come,” said Doris Reeser, assistant director of capital planning, deferred maintenance, and classroom programs at Illinois Facilities & Services. Other improvements include the restoration of the Mathematics Library by replacing missing glass floor panels in the stacks and restoring the open appearance of the colonnade to the east. If funding permits, the library renovation will also include installation of a back-lit ornamental glass dome to illuminate the atrium properly for the first time since the original glass dome was removed in 1942. The last time Altgeld Hall received significant renovations was in 1956, when the School of Law moved out of the building and the Department of Mathematics moved in. Mathematics is still located in the building. 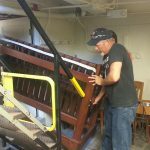 Heating and air conditioning will be replaced throughout the building, vastly increasing energy efficiency, improving the classroom environment, and protecting the valuable collection of the Mathematics Library. Furthermore, a second elevator will be added to make all portions of Altgeld Hall accessible. The renovations to Altgeld Hall will encourage environmental sustainability with the project targeting Leadership in Energy and Environmental Design (LEED)+ Gold certification through the U.S. Green Building Council. While campus is still assessing capital improvements to Altgeld, repair work continues on the chimes. The playing chamber room and the playing and practice stands were repaired last summer. 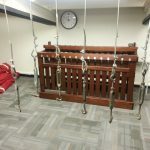 Work on the bells, clappers, pulleys, cables, and supporting frame should be completed this upcoming spring semester, according to Steve Breitweiser, manager of external relations for Illinois Facilities & Services. AFMFA is currently the primary source of funding for deferred maintenance projects on the Urbana campus. Since the program’s inception in 2007, student contributions have addressed more than $200 million in building projects that strive to make a significant impact on teaching and learning environments. 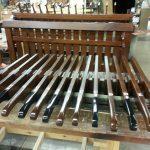 Some handles on the chimes practice and playing stands had to be remade before they were returned to the playing chamber. 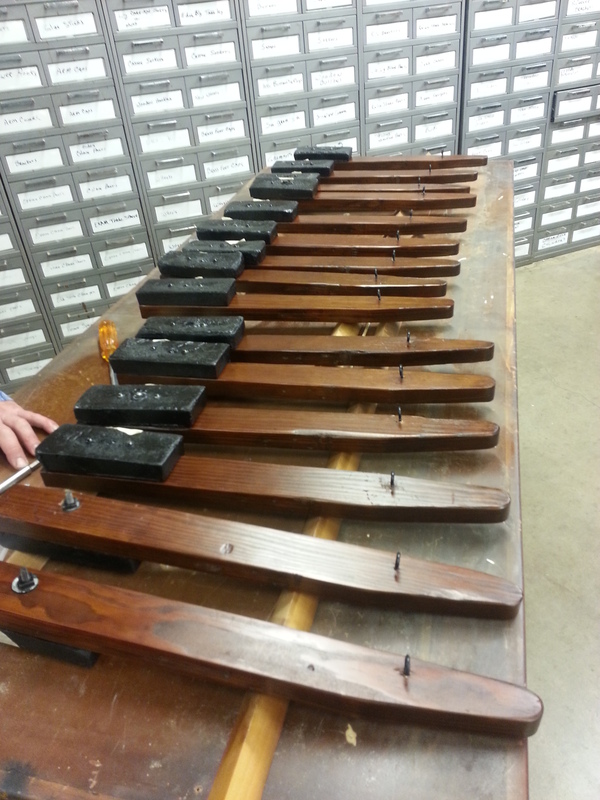 Sharp handles on the Altgeld Hall chimes playing stand have been painted, and all note identifiers have been applied and polished. 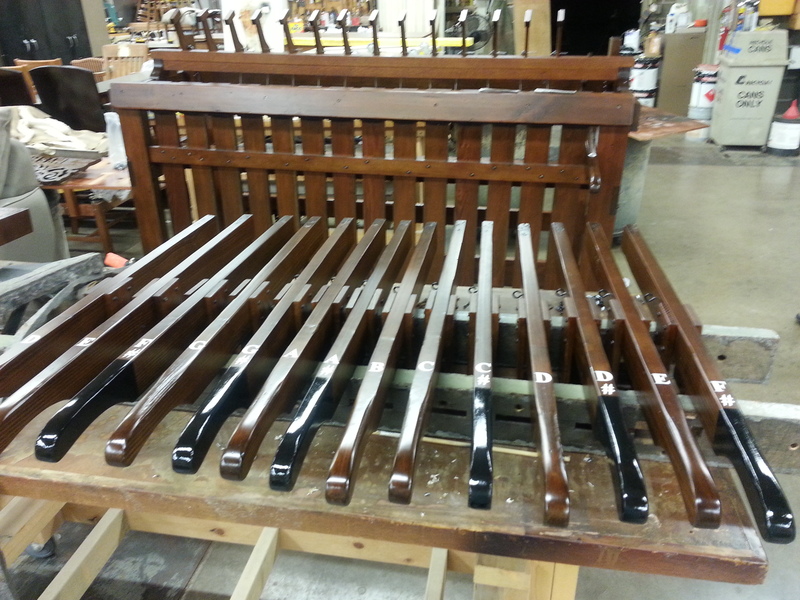 Sharp handles on the Altgeld Hall chimes playing stand have been painted, and all note identifiers have been applied and polished. Some handles had to be remade. 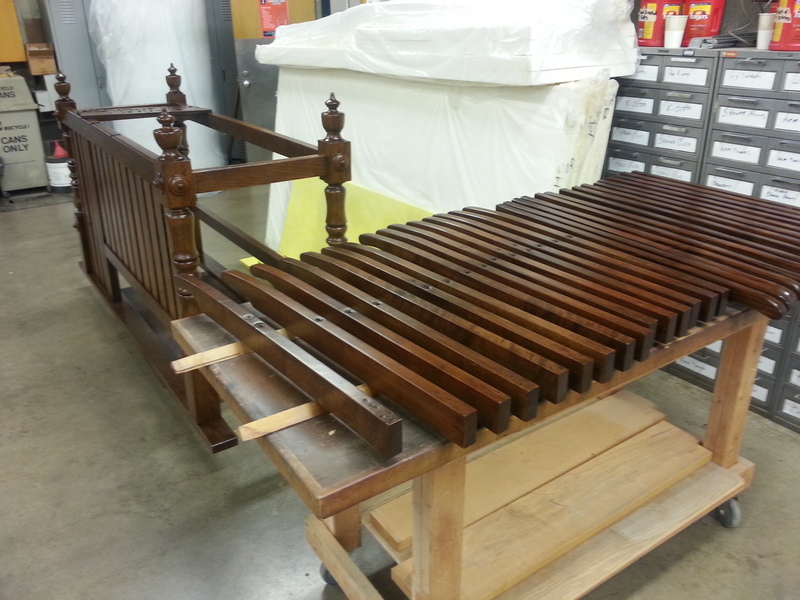 The refurbished playing stand ready to be installed in Altgeld Hall. 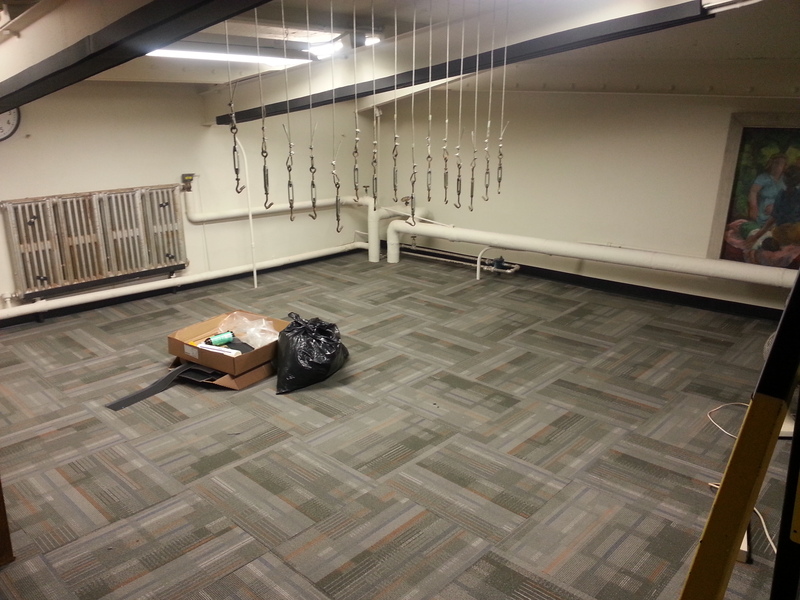 Flooring in the Altgeld Hall playing chamber has been leveled, and new subfloor and carpet tiles have been installed. 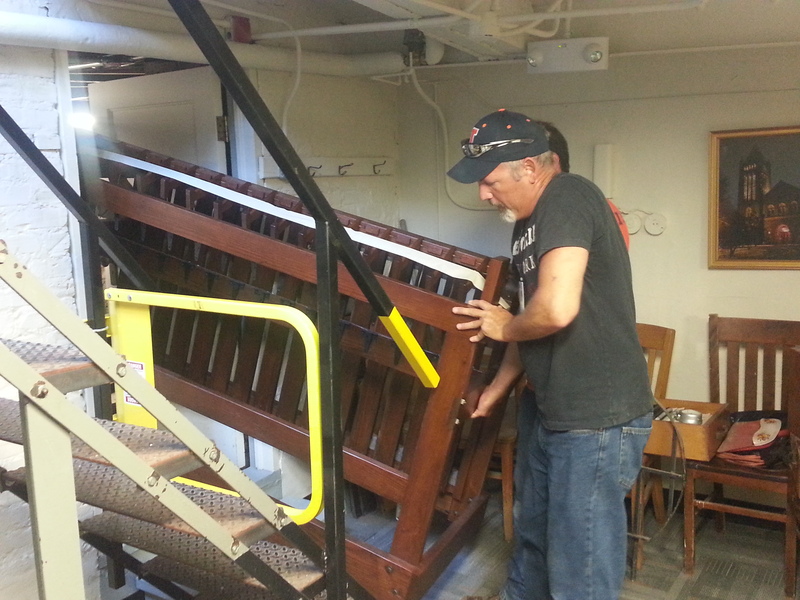 Facilities and Services workers reinstall the newly refinished chimes playing stand in Altgeld Hall. 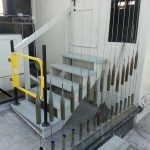 Handrails and supports have been installed on the steps leading to the shed that houses the automatic chimes mechanism shed. 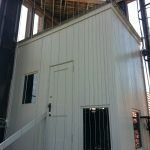 The shed housing the automated hour/quarter hour chimes mechanism has been refreshed and repainted. 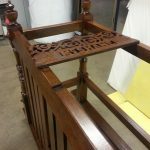 The restoration work on the historic Altgeld Chimes at Illinois is progressing rapidly, said Matthew Tomaszewski, the associate provost for capital planning. 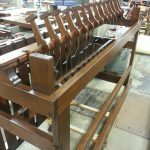 He’s leading a diverse team of Facilities and Services engineers, carpenters, movers, upholsterers, painters, and others who are bringing the beloved chimes back to life. While the chimes are still being played through automation on the quarter hour, the live, weekday afternoon concerts had to be suspended to allow the restoration work to be done. The playing chamber has been leveled, eliminating tripping hazards, and orange and blue carpeting tiles have been installed. 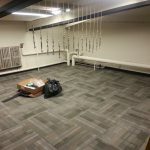 The walls have been repainted, damaged furniture replaced, and refurbishing of the playing and practice stands for the chimes is 90 percent finished, Tomaszewski said. “It’s pretty amazing from what it was to what it is right now, but there’s a long way to go yet,” he said. That’s because the restoration work on the bells, clappers, pulleys, cables, supporting frame, and masonry is yet to be done. The university expects to sign an agreement with a company that specializes in clock and bell repairs soon. After that, it is expected that repairs will take six months, unless additional damage is found, he said. 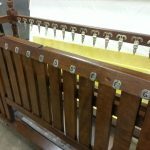 Tomaszewski hopes current and future chimes players will be delighted with the detailed restoration work on the playing and practices stands, which have been stripped and re-stained. Handles that play sharps have been painted black and all of the note identifiers have been applied and polished. New pieces were fabricated, crumbling nuts and bolts replaced, and new felt and pads have been installed. 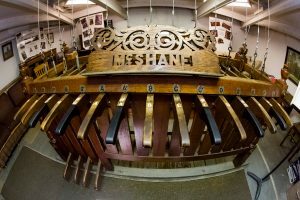 “All the chimes players care so much about the instrument itself; they want to make sure it’s in good hands, and of course it was done beautifully,” he said. 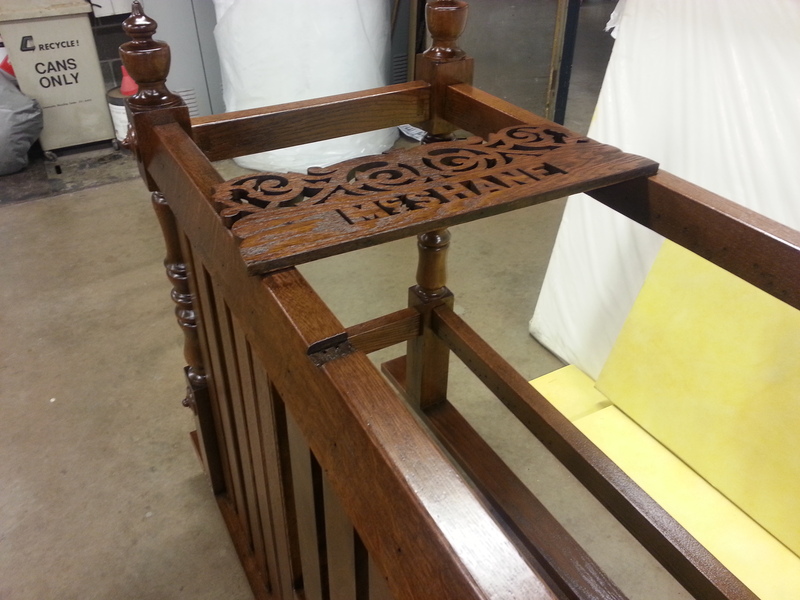 “The furniture shop and mill shop team, they have done an outstanding job with the repairs,” he said. “Basically, when the players played, the whole rack would shake from side to side, and it was becoming unstable.” Because of the years of wear and tear, and because of water infiltrating the room at times, many pieces were too damaged to re-use and have been replaced, he said. “The chimes are such an important part of people’s experience of our campus. It’s sad that it’s closed right now, but wonderful that we have the opportunity to actually take care of something that’s such an iconic piece of campus, and when we re-open, during the Sesquicentennial celebration, to have all of this attention on it, I think it will be wonderful to have the chimes playing again,” Tomaszewski said. 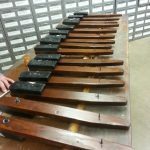 Editor’s Note: This article about the Altgeld Chimes was originally published in July 2014. Thousands of students attend Sue Wood’s daily concerts simply by walking to class. Many of them have never seen her. 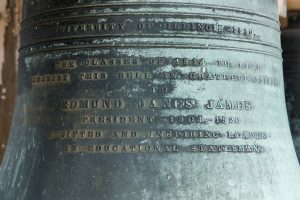 Six stories up in the Altgeld Hall tower – where chimesmaster Sue Wood has played the bells for the last 43 years – the day’s chimes performance resembles a finely tuned ballet. 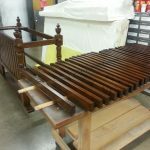 Poised in front of what looks like a seven-foot-long marimba, Wood grabs a wooden “pump handle.” She pushes down and releases the lever quickly, the attached cable vibrating through the ceiling to wake up the bell above. The handle is still clattering as Wood moves on to the next lever and the next note, her eyes focused on the sheet music. Weaving hand over hand, Wood rings out the Illinois State Song with fluid ease before five automated hammers toll the Westminster Chime and the hour. Because concerts are performed during the traditional class “passing times,” Wood has about 10 minutes to play as many songs as she can before the clock chime automatically strikes 1 p.m. Mistakes do happen, Wood said, but no one knows who’s made them. That’s one perk of being the anonymous conductor of a 15-bell choir. Decades ago, Wood said she even helped provide chime cacophony to accompany the university band’s performance of the “1812 Overture” on the steps of Foellinger Auditorium. When Wood got a telephone call in the tower, she’d ring the chimes “lickety-split” on cue so that concert goers in the Main Quad would hear chimes behind them at Altgeld Hall and in front of them at Foellinger. The Altgeld Hall tower was built specifically to hold the bells, not students. The Classes of 1914 through 1921 managed to raise enough money for 13 bells, but not the 15 total required to perform “Illinois Loyalty,” the main school song. Following the end of World War I, the U.S. School of Military Aeronautics – which held exercises during wartime and was preparing to leave campus – gave $2,000 in a memorial fund to add the necessary two bells. 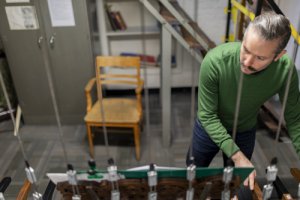 The rest is a rich history that includes more than 2,000 different arrangements transposed for the Altgeld Hall chimes since the bells’ dedication at Homecoming in October 1920. Even after four decades with the bells, Wood said she doesn’t know any chimes music by heart yet. Well, except for “Hail to the Orange,” a change ringing fragment and the Illinois State Song. Wood grew up playing the piano, but ultimately became an analytical chemist, receiving her Ph.D. in plant pathology from Illinois and retiring early from the Illinois Natural History Survey. Being a chemist and playing the chimes aren’t so different from each other, Wood said. “Math and music always connect,” she said. 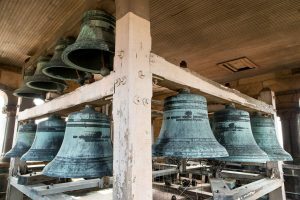 Her first introduction to bells was as a graduate student and the former carillon – a bell system with 23 or more bells – located at University Lutheran Church near campus. She soon found Albert Marien, Illinois chimesmaster from 1958 until 1995, and learned the technique of playing the Altgeld Hall chimes from him. 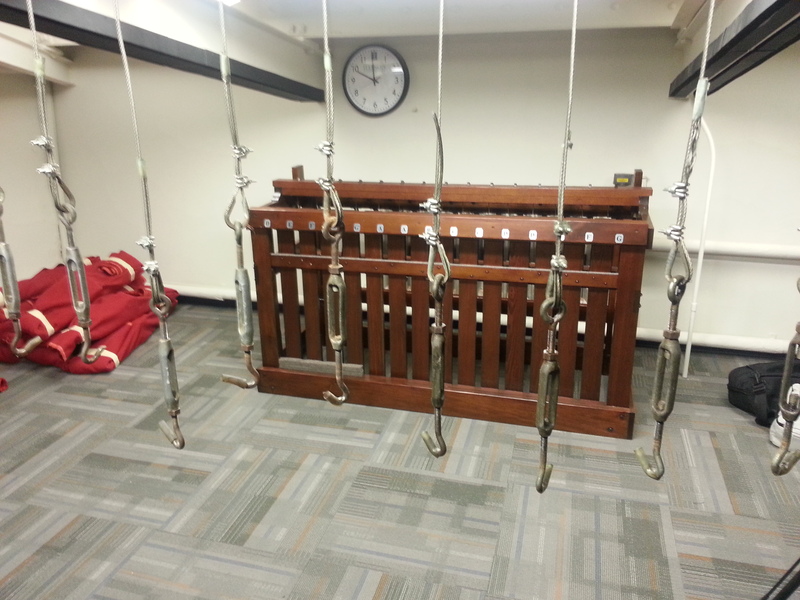 The Altgeld Chimes are played with hammers in the third floor of Altgeld Hall. Wood said Marien took great pains to promote a regular chimes program at Altgeld Hall. She’ll continue to do the same, as long as she’s still ringing the bells and has student volunteers willing to learn. “To learn from Sue has been wonderful because she’s such a master of the art, and also just a very lovely person,” junior and chimes student Amy Liu said of Wood. Like Wood, Liu enjoys the anonymity that comes from playing the chimes, too. “To me, it’s really romantic to be able to play music for so many people and to be anonymous,” Liu, an urban planning major, said. Sometimes romance seeps into what Liu performs. If you catch strains of “Off We Go into the Wild Blue Yonder” coming from Altgeld Hall, that’s Liu playing “The U.S. Air Force Song” as a nod to her boyfriend, a former Illinois student planning to join the United States Air Force. When Liu comes to play at Altgeld Hall – about every other week depending on her schedule — she mixes it up with a song from “Lord of the Rings,” “Star Wars” or “Fireflies” by Owl City. A maintenance worker has also requested a chimes cover of Moody Blues’ “Knights in White Satin.” She’s still working on that one, as well as “Bold As Love” by Jimi Hendrix. In Liu’s hands, the bells often sing George Gershwin. “People probably hear that often,” Liu, a classic jazz lover and banjo-playing member of the Folks and Roots club on campus, said with a laugh. The chimes are not chromatically complete, Wood said, because the eight classes arranged to have only enough bells to play “Illinois Loyalty”; the chimes are missing a lower D sharp and both F naturals, so music has to be transposed into the keys of G, D, or A major. New music is still being created, however. One of Wood’s chimes students, Jonathan Smith, arranged a version of “Alleluia! Let Praises Ring” as an Easter duet for him and Wood to perform. If you hear music coming from Altgeld Hall, Wood said, that means someone is always up in the tower, playing. Wood said the building has survived to become home to the Department of Mathematics with a tower full of bells that continue the tradition of the chimes concerts. “And I guess it’s going to survive a little longer,” Wood said. The News-Gazette in Champaign has covered Altgeld Hall several times. “Altgeld Hall’s rough-hewn Romanesque architecture has always made it stand out in a sea of green-roofed Georgian buildings on the University of Illinois campus,” Paul Wood wrote. Read the full story. And, the paper shared Chair Matthew Ando’s thoughts on what makes Altgeld a special place. Read his thoughts in the story. 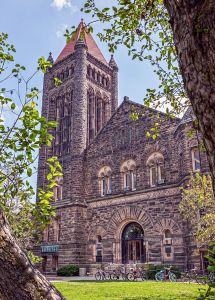 Altgeld Hall has long been recognized as a gem on campus. One frequent topic for news stories: its chime. Chimesmaster Sue Wood and the Altgeld Ringers put on daily concerts from the attic of Altgeld.